Very rarely do I come across novels that make me slow down, catch my breath, and actually reflect. Usually, I’m too caught up in the rush of the next book that I fly through my current read, type out a review, and put it behind me. Granted, I remember my favorite titles fondly, discuss and recommend them often, but either than the twist of my gut or intense swooning while reading, my love affair with the novel has ended almost as quickly as it began. Golden and I, however, are on an extended honeymoon – one I suspect will go on for awhile. Quite simply, I cannot get this book out of my head. Its quotes, its characters, its plot…all of it keeps spinning around and around in my head like a revolving door without air resistance to stop its momentum. I wish there was an apt anecdote I could find to convey exactly why this book struck such a deep chord within me, but there isn’t. Although I cannot determine the reactions of other readers, I know for a fact that Golden is so special to me merely because it mirrors my own hopes, fears, aspirations, dreams, and life itself so perfectly. In fact, I’ll take a leap of faith and simply state that Golden mirrors the thoughts of so many teenagers on the cusp of adulthood. For the first time, I have finally found a New Adult novel I am proud to call New Adult because it is deserving of that title. Golden is what New Adult should be – rich, intellectual fiction that transports its readers to the troubles of finding oneself in the world. Parker Frost, the protagonist of our tale, is a very typical heroine: class valedictorian, perfect goody-two-shoes, and set to win a scholarship to attend Stanford. Now, as her senior year is winding to a close, Parker helps Mr. Kinney return journals to his students from ten years ago. Every year, Mr. Kinney asks his seniors to reflect on their futures in a journal, only to ship it back to them in a decade. One of the journals Parker stumbles across, however, is written by Julianna, a teenage girl who died in a car crash with her boyfriend ten years ago on the night of graduation. Julianna and her boyfriend were seen as the Golden Couple, the two who “had it all” and their story has become the stuff of legend in the small town Parker lives in. As such, Parker cannot help but read her journals, but she soon learns that the girl whose life – and love – they all believed to be perfect was far more flawed than they thought. And, as Parker begins to follow the story of Julianna, she just may find herself as well. What I love about Golden is how unflinchingly honest it is. Although, at its core, it’s a mystery novel unraveling the truth of Julianna’s past, it is simultaneously a novel of friendship, first loves, family, and most importantly, finding yourself in a world full of people whose lives are entangled with your own. Although Julianna and Parker are starkly different people, both have lived their lives without making decisions for themselves, but for others. For Parker, it is her mother who she is fearful of disappointing and, as such, she becomes the person her mother wishes she herself was at her daughter’s age, stifling out who her daughter really is on her own. Although the interactions between Parker and her mother are minimal in this novel, they carry their own weight and the impact of even minor conversations is felt so palpably through Parker’s actions. Jessi Kirby, who failed to make me a fan of her writing with In Honor, successfully made me fall head-over-heels for her talent by capturing the tenuous and delicate relationship between a mother and a daughter in a way that felt only all too real. And, if I’m being honest, this is the heart of Golden. Its heart lies in Parker undertaking a task she feels passionate about – the mysterious death of Julianna, who she feels bonded to through her journal entries – and pursuing it to the point where she breaks the rigid rules her mother has always placed in front of her and finds herself while searching for completely different answers. Golden may belong to Julianna or to Parker, but these two never outshine one another, somehow managing to connect with us despite – or perhaps because of – their differences. All the relationships Parker experiences are like this, whether it is the inevitable separation with her best friend or the drawn-out tension between her long-standing crush, Trevor, so much is explored and comes to light during Parker’s journey. In terms of the romance, especially, I was pleasantly surprised by its subtleties; by its ever-present undercurrent that never managed to overtake the plot, by its sweet and eternal factor that was far more touching than any amount of swoon, and by its realistic ending full of hope. Yet, even more poignant were the ongoing messages of choices and fate. Although Parker learns and uncovers more than she bargained for on the journey she undertakes, she comes to realize that she has the choice to change her future – if only she is willing to act on it. If only she seizes the moment and doesn’t let it slip by. After all, life, as she learns, only gives you a few fleeting moments, a few chances, and it’s up to you to take them or leave them, if only you are daring enough to reach out and take that leap of faith. Moreover, all this self-growth is presented in a very realistic fashion. All the ultimate decisions Parker makes are perfect for whom she is and her relationships, whether they be romantic, familial, or friendly, are all viewed in the lens of reality; of inevitable change just around the horizon. And I love that. I love that perfect relationships don’t exist, but that everything is in equal measures bitter and sweet. I love that finding your way doesn’t mean seeking the meaning of life, it simply means seeking the meaning in your life. And I love that happy endings are not permanent because all that really means is that sad endings aren’t either. 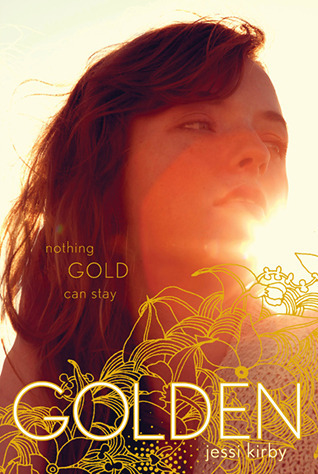 Golden is a novel that I emerged from a different person. Or, at any rate, it felt that way. It is inspiring, realistic, and beautifully written. In fact, I wouldn’t hesitate to throw it up there with my other favorite coming-of-age story, Wanderlove, and I know that I will inevitably wind up re-reading it multiple times. While Golden may have come to me as a godsend at the exact right time in my life, I suspect it’s one of those novels that transcend time and age, managing to resonate within you no matter what. If you read one novel this year, let it be Golden. It could be the road less traveled by – or it could not – but I can assure you, it really will make all the difference. Thank you to Simon & Schuster for providing me with an ARC of this novel in exchange for an honest review. This book sounds fantastic, unfortunately I didn't get accepted for a copy, but I'm do pleased that it was a 5 Star rating! The cover is gorgeous, it sums up what I'm feeling like right now. I think is is a perfect book for me. Lovely review, Keertana! "I love that finding your way doesn’t mean seeking the meaning of life, it simply means seeking the meaning in your life." That is a great line, K! And so true. I loved the romance in this book too, especially Julianna's. SWOON. I loved all those themes of fate and destiny and karma and serendipity. I am always attracted to books that feature story lines that incorporate that kind of magical realism:) Awesome review! It's nice to read a review from the perspective of someone who wasn't already a Jessi Kirby fan but who now has become one. Even though I've gotten a bit better, I still tend to shy away from YA contemporaries set in high school. I'll be a bit snobby here and say that lots of times I find them to not be so thought-provoking or truly make me reconsider my life in new ways. Based on your lovely review and a few others, it sounds like Golden is as far-removed from my stereotypical notions as possible. This is such a lovely review, Keertana, and, based on reader responses thus far, I'm pretty sure it will transcend age ranges. I can't wait to read it myself! Your review for Golden is so beautiful Keertana! It doesn't sound like your usual contemporary YA novel. I like the fact that it seems to have a lot of depth. I always enjoy books like that. I might actually pick this one up. Ackk, Keertana, I'm tempted to print this review out just so I can highlight the crap out of this post. I seriously can't wait for the day I get to read YOUR novel because I already know it's going to be gorgeous, if this phenomenal review is any indication. But anyways, honestly, this book wasn't really on my radar. Until now of course. I haven't read much New Adult, but this book sounds like it's really the essence of what New Adult should BE. This depth with almost all aspects of the MC's life seems utterly fantastic as well. I think I'd totally be able to relate to this main character, since she seems SO much like me. I'm REALLY excited to read this one. I have loved both of her previous books and I'm sure I'll love this as well. What I find interesting is that you say that you didn't love In Honor and a good friend of mine did and then found this one to only be okay. I loved In Honor, but I'm not sure I LOVED it. I can't remember if I gave it 4 stars or 5. I DO know I LOVED Moonglass though and so much of it was just her writing was SO beautiful! Anyway, I'm definitely going to have to get this one. Hopefully I love it as much as you did! Your intro alone would have convinced me to read this, Keertana, and I have been hearing nothing but good things about this book! Oh, this sounds so amazing! I really need to get my hands on this book soon. Absolutely gorgeous review, lovely! I've had my eye on this book, but you've completely convinced me. I know you don't rate a book 5 stars lightly, so when you do, I sit up and listen. This sounds fantastic! I honestly would never have even considered it if it hadn't been for all the positive reviews recently (thank god for bloggers). The idea of the journals is quite interesting. I remember Wendy mentioning that and it's stuck with me since. I'll have to give this one a go. Really beautiful review! You have a wonderful way with words, my dear. I was planning on reading this book some time after it's release but I should have known your review would make me want this book NOW. This is such a beautiful review Keertana. Parker sounds like me in the sense that I'm often told I'm Miss Perfect Goody-Two-Shoes and as my senior year is winding down, I feel like I've done nothing these last four years. I'm glad that you've become a fan of Jessi Kirby! Oh Keertana, this review is absolutely beautiful. I love how you connected with this book and yes--this is what New Adult should be. You know I have a love for things that ring real and true, a love of the bittersweet, and so I wonder how I would react to this novel despite being long past this point in my own life. I love hearing from my readers and I read, reply, and appreciate every one of the comments I receive! (: If you're a fellow blogger, please leave a link to your blog - I'd love to drop by! Unfortunately, this is now an award-free blog. I simply do not have the time to respond and forward on the award, but I truly appreciate the nomination regardless. 4 Stars - I really liked this one! It was an amazing read, but it lacked just a little something to make it better. 3 Stars - I liked this book, but it wasn't amazing in the least. It's definitely worth reading, but you should probably borrow this one. 2 Stars - It was okay. I didn't really enjoy this one, but it wasn't horrible either. 1 Star - Skip it. Run away from it. Look the other way when you see this on the shelf. I didn't like it and I probably wouldn't even recommend it to my worst enemy. What If I Don’t Have Enough Personality to be a Public Personality? ¿Cuáles son las pulseras de moda?